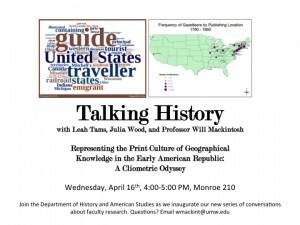 Next Wednesday, April 16th, I will be talking with the Department of History and American Studies about an ongoing cliometrical research experiment I have been undertaking this academic year. 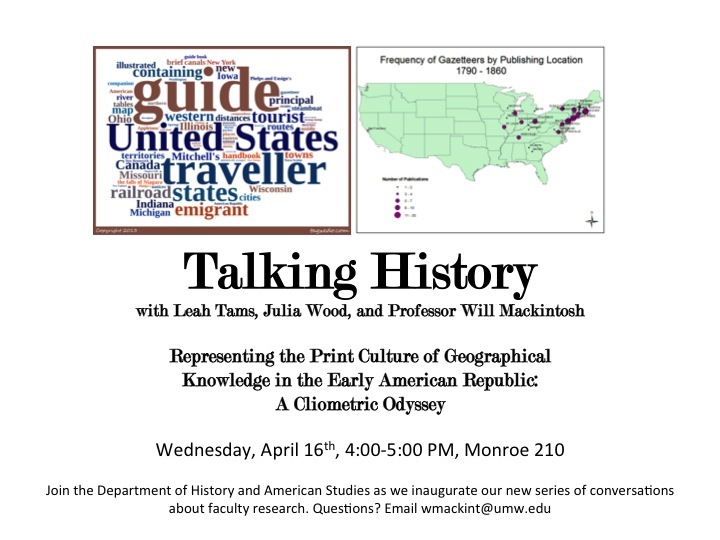 With a research team of two outstanding senior history majors, Leah Tams and Julia Wood, we have built Excel databases of American geographical publications from 1800 to 1860. We specifically targeted gazetteers, “geographical grammars,” and tourist guidebooks. Using data pulled from the WorldCat union library catalog, we have attempted to make each of those databases as comprehensive as possible. Then, using Leah’s graphing skills as a math minor and Julia’s GIS skills as a geography double major, we have experimented with developing visual representations of this data that can give us new insights into the ways in which the market for American geographical knowledge changed during the first half of the nineteenth century. Leah’s charts and wordclouds illustrate the topical convergence and increasing seriality of guidebook publications, while Julia’s maps show how the publication of different genres was commercialized in uneven ways. In each case, their visual representations reveal long-term trends starkly and strikingly. All this work is contributing to my larger project on tourism and the commodification of experience in the nineteenth century. It reveals how the print culture of geographical knowledge was increasingly commercialized and industrialized in the years before the Civil War, turning knowledge of space into a commodified experience of space, available on the shelves of booksellers across the United States.